Jan Bijvoet holds all who behold him captive as the hawk-faced vagrant Camiel Borgman. In the opening scene, Borgman is rousted from his underground lair in the woods by a striking trio: a bald man with a dog, a tall man with a lance and a priest with a shotgun. Making a narrow escape, he warns two other vagrants also sleeping beneath trap doors in the earth that the townspeople are onto them. Escaping to a suburban neighbourhood, Borgman goes door-to-door asking upper-middle class homeowners if he can have a bath. When he attempts to lie his way into one home the alpha male patriarch, Richard (Jeroen Perceval), almost kicks him to death. Taking pity on the injured man, Richard’s wife Marina (Hadewych Minis) allows Borgman to bathe and stay one night in the summerhouse of her huge garden. One night becomes a week and the rule that Borgman should not come into the house is broken again and again, as he becomes an ever more trusted and accepted figure by Marina and her three platinum-haired children. When Borgman decides to leave and “play” elsewhere, Marina begs him to stay and so, with the help of his network of mysterious fellow vagrants, Borgman takes the place of the family’s gardener and begins a sinister campaign of mischief and extreme landscaping. In a typically European fashion the vagrants’ hijinks inspire glee as often as they inspire dread. One simple reason for this is that there is a kick to be had in watching Borgman’s troupe mess with an entitled, boorish Neanderthal like Richard. But what ends do these hijinks achieve? Richard’s violent temper and crumbling professional life suggest that his family could quite easily be torn apart without Borgman’s intervention. Marina’s dogged denial of Richard’s inadequacies is the only thing that keeps her in a comfortable open-plan house with a huge garden, a Danish au-pair and a spacious studio for her action painting. But Borgman is not merely a catalyst for the destruction of this home – just as he and his troupe are not merely tramps. Though they never seem to display any supernatural faculties, there is a biblical air of retribution to the torment that these people visit upon those who cross their path. Seen more than once perched on the belly of his victim, as if to peer into her dreams and delight at the suffering therein, Borgman resembles the incubus in Henry Fuseli’s eighteenth-century baroque painting, The Nightmare. The mark that Borgman bears on his back suggests at first that he and his kind could be devils without wings. Corruption of the modern world and its selfish, hubristic inhabitants seems to be Borgman’s objective but there is a sense that the vagrants’ evil actions could easily be justifiable in the minds of celestial beings who disdain human ignorance and weakness. Either way, to these otherworldly people, human life is worth very little. The key to understanding the obscure motives of Borgman and his merry band seems to lie in Marina’s children, each an image of purity cut from an archetypal wealthy European family. There is a distinct sense that through this whole process Borgman is recruiting those family members that can be useful to him and punishing those who can’t. Borgman is a film as bewitching as its central character. The handsome setting, striking imagery, unpredictable plot and unsettling central performance from Jan Bijvoen keep all eyes locked on the screen in anticipation of what could possibly come next and what motivates Borgman’s troupe. It is utterly compelling but the obscure nature of the troupe and their actions is only satisfying in as much as it appears to achieve some open-ended resolution. 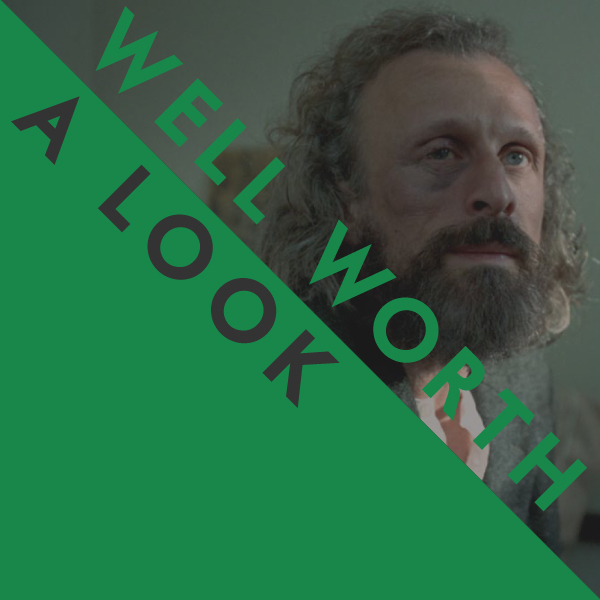 The outcome of falling under the spell of the film is not any more fulfilling or comforting for the audience than it is for the characters under the spell of Borgman himself. Van Warmerdam’s criticism of the Netherlands’ affluent middle class is so blunt that it seems almost shoehorned in and makes for a mundane subtext when compared to the tale of children saved from the corruption of social values, which also appears to unfold, albeit incidentally. The narrative arc of van Warmerdam’s script is satisfying but falls short of the thematic sophistication implied by the level of care and craftsmanship on display. Sadly Borgman comes off as closely related to the likes Adam Winguard’s hollow genre mash-up The Guest (2014) as it is to the likes of Michael Haneke’s Funny Games (1997).